Anybody recognize this wallpaper? 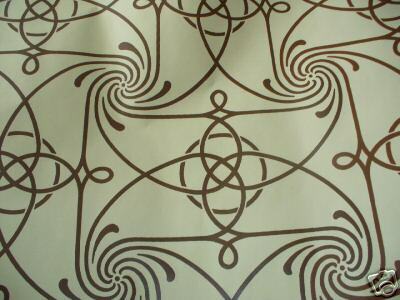 I found on it on EBay Friday night, but I’ve never heard of Louis Sullivan wallpaper and Google wasn’t any help at all. The seller described it as “a reproduction of a late Victorian wallpaper in the Arts and Crafts style. The original pattern was inspired by the work of 19th century architect Louis Sullivan.”Â (Sullivan wasÂ born 1856, died 1924.) Â It’s cool (I think*), but something I’ve never heard of. The manufacturer is a company called The Paperie, but the only company I could find by that name online sells scrapbook materials, not wallpaper. There’s a date of 1976 on a detatchable edge, but I don’t know if that’s the date of design, of production, or something else. No idea if it’s prepasted, but it looks great, no fading or other flaws. Didn’t win. Â (Didn’t bid too much, since I was bidding without Don looking at it and it was a bit outside my usual comfort zone since it wasn’t Bradbury & Bradbury or Burrows & Company or Brillion or Wolff House or anything else I had heard of. )Â Oh, and let’s not forget another good reason not to buy wallpaper: Â I don’t actually own a house it can go in. )Â It sold for $17.51 + $13.49 s/h. Now, of course, I am wishing I had won it.Â So, if you have a source for it, let me know.Â Or if you know anything about The Paperie.Â Did they make anything else in the way of historic wallpapers? * A bit worried that, if I had won, Don would think it’s 1970s, rather than 1870s.